Italian Apparado da campo per telegrafia inintercettabile. 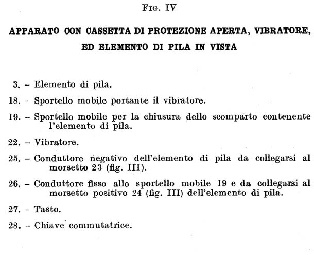 The Italian ‘Apparado da campo per telegrafia inintercettabile’ (Non interceptable Field Telegraph) was an Italian Army instrument based on the WW1 pattern and Mk.III British Fullerphone, fielded around 1931. It missed the potentiometer and Morse key reverse contact features and buzzer calling. The buzzer/chopper was permanently connected when switched to Telegraphy, though in a slightly different circuit. It was easy accessible for minor adjustments, but it could not be removed as with the British Buzzer F, used in the later Fullerphones Mk.IV to Mk.6. It had not the built-in speech feature like most of the British WW1 and Mk.III Fullerphones, but a separate field telephone should be connected to the line via a switch on the panel. 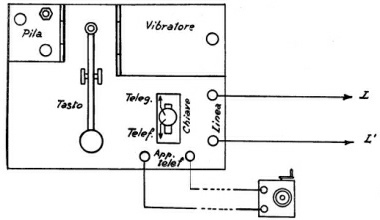 General view of the Italian Fullerphone. When not in use the headphones were stowed in a compartment at the bottom of the instrument, accessible from the side. 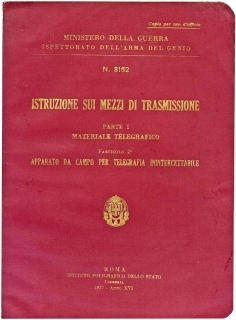 - Instruzzione sui mezzi de Trasmissione, Part I, Materiale Telegrafico, Fascicolo 2, Apparato da campo per Telegrafia Ininterceptabile, Roma 1937. Top view of the Italian Fullerphone with buzzer access panel opened for adjusting the contacts. This procedure was extensively described in the user manual. (Right). 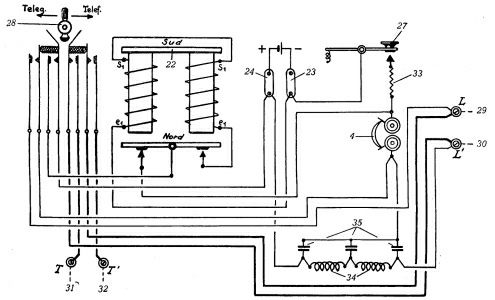 Circuit diagram and layout of connecting to a normal field telephone via terminals T and T’.